Thread: Proxy & Translation services: Doujinshi & more directly from Japan! ❀ Order doujinshi/manga/figurines directly from Japan! ❀ Pick from literally any fandom! If we can find it, you can have it. 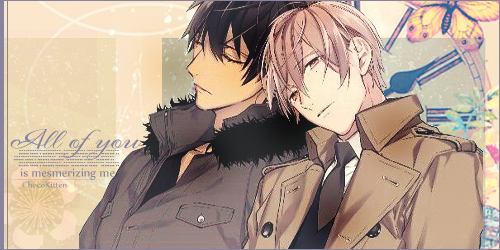 ❀ Get doujinshi translations for your favorite pairings! ❀ We can translate raws or order you a physical doujinshi. ❀ High quality translations from a native Japanese/English team. ❀ Very reasonably priced translations; only $1 per page! ❀ Worldwide shipping through Japan Post. EMS available. ❀ Accepts Paypal, USD & JPY. Seductive Sugar is a joint shop owned between myself and my husband. We offer a service where you may order doujinshi straight from Japan (that's where we live!) and have it personally translated for you by us. It's also possible to use our proxy service in order to purchase other goods such as figurines, for example. We can get you the latest doujinshi with ease - or if you're looking for something that's been out for awhile, fear not! We can often find it for you with a bit of digging around online. Feel free to send us links to online vendors that carry the item you're looking for or ask us to find it for you if you're not so savvy at searching on your own. With a native English speaker working alongside a native Japanese speaker, our translations are high quality and quick (provided we don't have a lot of classwork)! We work together to ensure high quality translations that maintain the original nuances and feeling while trying our best to make it sound natural in English. When working uninterrupted, we can translate a 24 page doujinshi in less than 2 or 3 hours if editing isn't needed. But generally, we try to get most works completed within a few days to a week. We'll let you know if it's going to take longer! We will also translate raw/scanned materials if you already have it! Our translation is among the cheapest I've personally seen, at only 1 - 2USD per page. Commission for goods depends on the order total. If you're ordering something we already have in stock, you do not need to add the commission fee to the price. Want to support your favorite artists? So do we! This is a great way to support the original artists! We all understand that scanlation groups are pretty much necessary as it's so incredibly difficult to enjoy this kind of content otherwise, but many artists DO NOT LIKE their work posted online in this manner - understandably so. Some even QUIT drawing over it! So if you've ever wanted to support the artists you love but felt conflicted because you can't read Japanese in order to fully enjoy the work, then we're here to help! We are extremely friendly. PLEASE, feel free to talk to us and discuss if you have any questions or concerns. We're 100% happy to talk to you even if you end up not using our service. Last edited by Chocokitten; 02-23-2019 at 04:41 AM. I had to put my services on hold when I started lab for university.... well, I'm graduated and my services are available once again. Feel free to contact me! It is best to contact me via emai though since I don't check this site all too often. (SeductiveSugarShop(at)gmail.com). Last edited by Chocokitten; 01-22-2019 at 12:05 AM.